However, for students and educators accustomed to more structured plans and teacher- or curriculum-directed learning, the decision-making and uncertainty can increase the amygdala’s stress level and inhibit flow to the prefrontal cortex where those networks of executive function are developing. This blog series will offer suggestions to ease the stress of transition, helping students persevere to reach the intrinsic pleasure that awaits them through meaningful choice and challenges in the classroom. I am an advocate of the goals embodied in the CCSS -- building strong neural networks of executive functions. These networks of neuron-to-neuron connections have been an essential element of the neurological examination of patients for over 75 years. The functions of these unique neural networks were initially revealed through neurological case histories of patients with prefrontal cortex degeneration, lesions or trauma. They consequently lost their "highest" thinking skills of goal-directed behavior, judgment, emotional self-awareness, deduction, reasoning, abstraction or subsequent skillsets. These networks directly impact intentional cognitive and emotional processing and behavioral output. Furthermore, these skillsets have become increasingly critical as we move from a factory-model labor force to a global, informational and technological labor force. Replication of knowledge and single correct responses are inadequate preparation for students entering vocations or going on to higher academic studies. The CCSS goals support cognitive actions that are the executive functions for a global economy. We cannot let this educational goal be subverted through the challenges posed by the tests themselves or how they are used. One of our goals is understanding how we might best support students during the transition from passive memorization to actively constructing understanding and applying knowledge. The uncertainty educators face about how best to prepare students for the changing goals and tests will be equally challenging for the students themselves. With the shift toward interpretation, communication, reasoning, and transfer of learning to novel applications, the repetition of facts is no longer the criteria for being "smart." The contrast will be especially profound for students who were previously successful working with predictable tasks of memorization and binary "right and wrong" assessment, and could also be more problematic to the majority of students who already lost out when the arts and humanities were dropped from their curriculum. From neuroimaging and correlated neurocognitive research, we've seen the impact of stress on neural processing of information and behavior output. The amygdala, deep in the network of the brain's emotionally responsive limbic system, is a prominent structure in this process. The amygdala is a switching station through which sensory input must pass to reach the prefrontal cortex (PFC) where long-term memory is constructed. When stress is high, increased metabolic activity in the amygdala limits flow to and from the PFC. We've seen students' responses to sustained frustration or increased boredom as school has become less engaging and relevant. 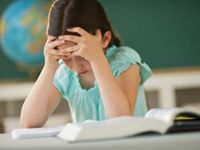 The students who were able to persevere and succeed by following rules and procedures and by retrieving the right answer are now at risk of stress responses due to shifts in assessments. As educators anticipated the requisite 21st century skillsets that are now the goals of the CCSS, their assessments included more interpretation of information and new ways for students to apply what they learned. These teachers have described a disturbing response by some students to open-ended test questions when they realize that rote fact memorization is no longer adequate preparation. Previous high achievers are showing fight/flight/freeze stress responses when tested with single-response questions. For these students, who had obediently and powerfully memorized all the information they were given, the loss of predictable test questions linked to their matched answers is unfair. Despite their success at memorization, they haven't developed the conceptual understanding or cognitive flexibility needed to respond to these unpredictable questions. Their teachers describe profound emotional reactions including anger, hostility, retribution (such as false accusations of teacher misconduct) and more subtle but equally disturbing behavioral changes of withdrawn participation and effort, depression, and more sick-day absences. There is no research available about the absolute cause or extent of this phenomenon. Perhaps the responses are so profound and unexpected that these stories are getting disproportionate attention. Nevertheless, it serves all students if we consider how to introduce the changes in information acquisition and application to make the transition less stressful. Knowing what to expect and anticipating your students' unexpected responses will help you prepare for the unpredictable. Building executive functions and developing concept knowledge means less directed, one-solution instruction and certainty. This shifts greater responsibility to students in the learning process, calling on their executive functions for evaluation, estimation, prediction and interpretation. After years of passivity and limited responsibility for communicating opinions and defending solutions, students will need to start formulating ideas, expressing them clearly, and defending opinions or solutions with logical and often subjective reasoning. Making mistakes and benefiting from corrective feedback will be part of any successful learning routine rather than an indication of failure. It will take effort to help students adapt to this mindset. Memories constructed through rote repetition can strengthen due to the subsequent neuroplastic response from very specific stimuli. However, when memories are built in response to unique drills and linked to specific prompts, they are only retrieved in response to those stimuli. These isolated memory circuits that haven't been activated for other applications are not available to solve unfamiliar problems or interpret new information. This will be new and frightening territory for many students. Even those who seem comfortable when you first introduce these new challenges early in the year can hit a wall as content and assessment take a turn toward uncertainty, requiring more intense application of their executive function. When students have built an identity around excelling at memorization and earning praise for grades, they may hesitate to reveal difficulties and ask for help to meet a new measure of success. They have been so comfortable parroting back information that a new demand for complexity can cause a freeze response, halting both confidence and thinking. For these students, watch for unusual behaviors such as not doing homework, acting out in class, angry outbursts about test questions not pulled directly from class notes or text, reduced class participation, or increased absenteeism. An ideal preemptive reaction on the part of educators would be to design new instructional or assessment characteristics that parallel the macro and cognitive objectives of the CCSS. Additionally, take time to explain that they will be building a new set of skills, and that you will be coaching them for success and not judging them for making mistakes. Share your own experiences of failure and change, as well as strategies for success. It will be most convincing and reassuring for students when they realize that these front and center executive functions will become stronger and more effective through their engagement with and resulting development from the new approaches to learning. In the next blog I will describe common student experiences that involve successful application of executive functions. These can help your students gain insight and perspective, thereby resisting stress and keeping neural passages flowing to and from their critical executive functions.